✓ IDEAL OF THICK OR INGROWN TOENAIL: The professional toenail clipper kit include 3 essential ingrown toenail tool:1 surgical grade stainless steel toenail nipper,1 ingrown toenail lifter,1 nail file,plus 1 free plastic blade protective cover.This 3 in 1 value pack is very convenient for daily use and can assist in your thick or ingrown toenail treatment. ✓ EASY CONTROL,SAFE FOR SENIORS:The ingrown toenail scissor comes with 2 spring,making it very easy to control and provides easier cutting effort for left and right hand user. Meanwhile,the ergonomic long handle of this upgrade toenail cutter is anti-slide and soft .Your toenail clipper will not slip out of your hands any more,very safe for senior users. ✓ HEAVY DUTY INGROWN TOENAIL TOOL:The sharp toenail nipper is 5.51 inches long, much longer than others nail nipper,it is suitable for both big and small hands.DeJAVU professional nail clipper has wide opened jaw for handle extremely thick toe nails.Moreover, the 25 degree arc of the blade fits the nail arc perfectly,it will keeping your feet healthy by trimming your ingrown nails or sharp pieces at the corners. ✓ HIGH QUALITY TOENAIL CLIPPER SET:The ingrown toenail lifter, nail file and the blade of the ingrown toenail clipper are all made of high quality medical surgical stainless steel.The precision aligned blade is lightly curved to make sure your nails end up smooth and clean,this ingrown toenail kit is the best gift for men and women! 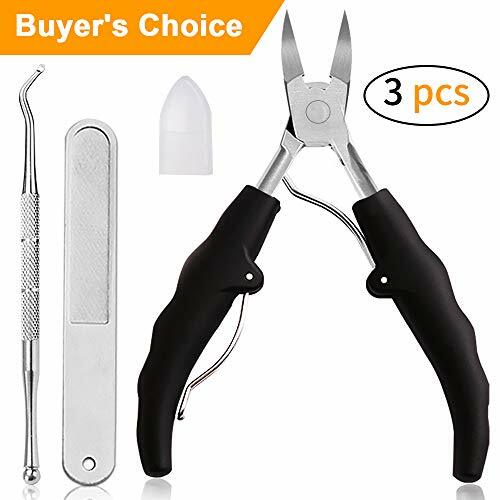 ✓ 100% LIFETIME WARRANTY:DeJAVU ingrown toenail clipper set provides Lifetime warranty for every customer,just contact us on Amazon then you will get your money back or a new replace one in 24 hours!